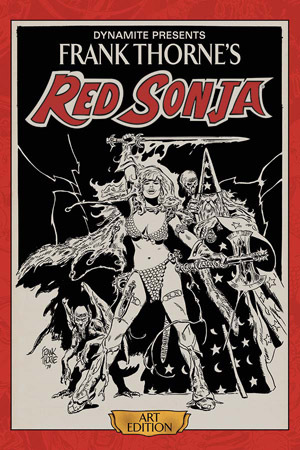 Two titans of the industry -- artist Frank Thorne and writer Roy Thomas -- come together again for this special dual-signed deluxe edition of Frank Thorne's Red Sonja Art Edition, featuring tip-in sheet autographs by the two men who pioneered the She-Devil with a Sword as a solo adventurer! Celebrate the seminal work of legendary fantasy illustrator Frank Thorne with this gorgeous hardcover collection, presenting for the first time the actual storyboard artwork from his complete 1976 run of swords-and-sorcery icon Red Sonja appearances in the Marvel Feature comic book series. Scanned in high-resolution color and printed at original size, Frank Thorne's Red Sonja Art Edition preserves every detail of the artist's meticulous skill and hard work, while simultaneously presenting a complete storyline for the enjoyment of longtime She-Devil fans.